One of the features of Yoast SEO Premium is the possibility to optimize your posts for related keyphrases and synonyms. And, what’s more, it will also recognize different word forms of the words of your keyphrase. Read on and learn what this feature can do for you and why we think it’s so awesome! If you want a post to rank for a certain keyword or phrase you have to optimize your content for that keyphrase. This focus keyphrase can be one word, but it’s more likely to be a phrase or part of a sentence. When optimizing your content for that focus keyphrase, our Yoast SEO plugin is a great help. It runs a check on your content to find out if you’re using your focus keyphrase enough – but not too much – and in the right spots. It does so in real time, so you can optimize your text while you’re writing! If you want to write an article that is nice and easy to read, you’ll probably use synonyms of your focus keyword throughout your text. That’s excellent, because repeating your exact focus keyphrase often impairs readability. Using synonyms is a way to help users understand your copy better and search engines will recognize these synonyms too. They’ll understand your text is still on topic! For instance, if you want to optimize for [dog game], you could, and probably will, use [dog sport] as a synonym now and then. This will make your text a much nicer read! In Yoast SEO Premium you can add these synonyms of your focus keyphrase, and we’ll be able to see if you’ve used those synonyms in, for instance, your meta description, introduction, subheadings or image alt text. Moreover, our keyphrase distribution check will reward you for alternately using your keyphrase, and it’s synonyms throughout your text. How do you add synonyms? Sometimes it’s hard to choose one keyphrase, because you want a post not only to rank for thát focus keyphrase, but also for a slightly different, but related keyphrase. Since Google has been getting better at recognizing relationships between topics, it’s smart to optimize your post for relevant, related keyphrases. For instance, if you want to optimize for [dog game], you might want to optimize for some of these games too, like [flyball] or [treasure hunt]. Luckily, our related keyphrase feature can help you out. It allows you to easily add related keyphrases. These keyphrases get a slightly different treatment than your focus keyword, as they’re not the main keyphrase you’re optimizing for. Our assessment is less strict, so it’s easier to get a green bullet for your related keyphrase. How do you add related keyphrases? If you write in English, you’ll love this feature! 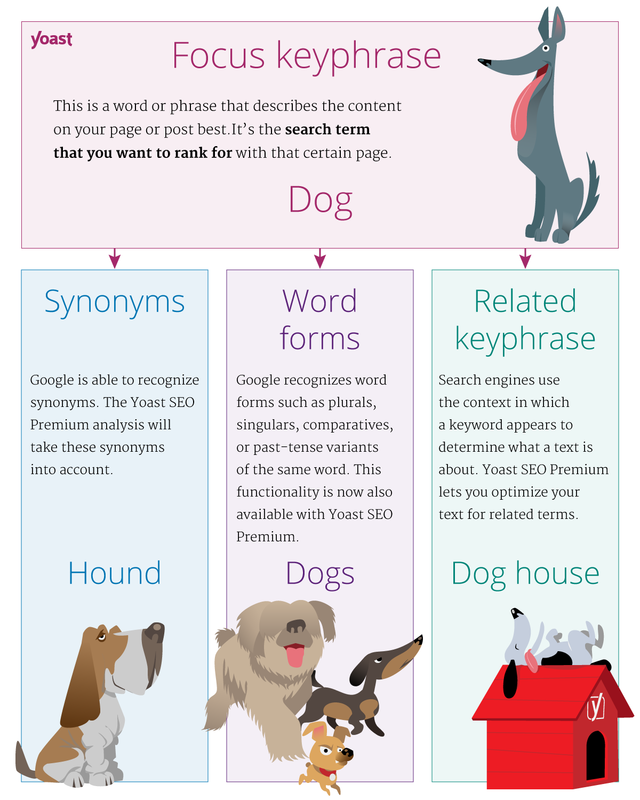 Yoast SEO Premium recognizes different word forms of your keyphrase (just in English for now). This means it will recognize singular and plurals, but also different tenses of verbs. This is awesome, because it will allow you to write in a natural and free way and get green bullets too! So, if your focus keyphrase is [dog game], it will recognize Read about these games for dogs too. Or, if you want to optimize for [play flyball] it will recognize the sentence, I love playing flyball with my dog as well. Word forms and synonym recognition all come together in one awesome feature: Keyphrase distribution. This premium-only check goes through your copy and assesses where you’ve used your keyphrase, its synonyms, or different words forms from the words in your keyphrase. If you get a green bullet, you’ve stayed on topic and probably found a nice balance in using all of those words. The best way to make your readers and Google happy! Pretty nifty right? And you can have this too! Get your Yoast SEO Premium license and get all this awesomeness! Yoast SEO Premium also comes with a redirect manager and premium support so be sure to check out all features of Yoast SEO Premium.